ONE OCEAN – SEVEN STRAWLESS SEAS – Taylor Slater | EasternSurf.com | All East Coast. All The Time. (Montauk, NY July 9 2018) The Montauk Beach House is pleased to present One Ocean – Seven Strawless Seas, a solo exhibition and charity event featuring original works by American artist, Taylor Slater. The exhibition marks the official launch of Taylor’s work to the public and will be on view at The Montauk Beach House, 55 S Elmwood Ave, Montauk NY, with an opening reception & silent auction on Friday August 10, from 6 – 9 pm. 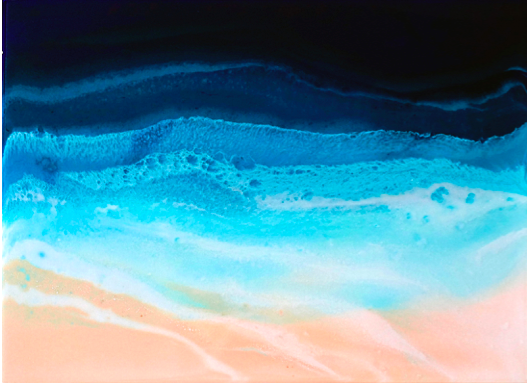 Taylor’s love for the sea is conveyed through her striking delineations in the overlapping cerulean, sapphire and greenish hues of her oceanscape resin paintings. Exclusive to the artists reception is the silent auction of one of Taylor’s works to benefit the amazing efforts of the Lonely Whale organization, who will be present during Taylor’s reception, highlighting their mission and creating awareness towards their ongoing campaigns. The Montauk Beach House is a well-appointed 33-room boutique hotel in the heart of downtown Montauk with an active daytime pool-centric environment and a comfortable, warm, chill-out-by-the-fire-with-friends vibe at night. A social gathering space to eat, drink, have fun, and make memories. The Beach House aims to provide guests with memorable stays that highlight comfort and simplicity; set in a relaxed ambiance balanced with the right touches of luxury. The summer events programming is specifically tailored to fulfill a top-notch hospitality experience via art exhibits, music entertainment from renowned djs & live acts, retail offerings, special events and collaborations with like- minded brands – hosting activations, trunk shows, interactive guest experiences and more. Lonely Whale is an incubator for courageous ideas that drive impactful change on behalf of our ocean. Inspired by the power of community, Lonely Whale is working towards a new era of radical collaboration, facilitating innovation that pushes the boundary on current trends in technology, media and advocacy to positively impact ocean health. Lonely Whale’s creative efforts to reduce, and ultimately eliminate, ocean-bound plastic pollution have earned them recognition as one of Huffington Post’s Top Ten Movers and Shakers in Environmental Sustainability and Fast Company’s World Changing Ideas as well as honors from the Cannes Lions, Effy, Shorty and ADDY Awards in 2018. For more information, visit www.lonelywhale.org or follow along on Instagram, Facebook and Twitter @lonelywhale. direct line between creative inspiration and organizations working toward a healthy ocean environment. 1Ocean Collection covers a variety of works including photography, visual arts, music, and theatre.